This roadside horseradish stand was the last of its kind in Banning, CA. Visiting Hal was like stepping back in time. I wrote about this for patch.com. 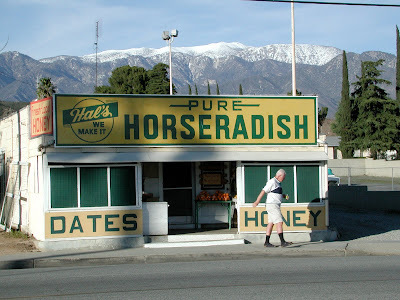 Hal made his own handmade horseradish, and his roadside stand was all that remained of the era when roadside businesses flourished along the old highway through Banning. Hal has closed his business now, and our holiday dinners will never be the same.